Anybody who is familiar with Reedsburg probably knows where Nishan Park is located on the city’s northeast side. The sprawling park boasts six ball diamonds, outdoor volleyball courts, picnic shelters and the Reedsburg Area Community Arena or RACA building used for hockey and ice skating in the winter and for other events the rest of the year. The park was made possible be a bequest of $300,000 from the estate of Edward Nishan who died in 1975. Edward Nishan, was born as Yervant Nichanian in 1880 in Istanbul, Turkey and would never have known where Reedsburg was had it not been for his wife Freda Meyers Nishan. Like her husband Freda Meyers was also born with a slightly different name. 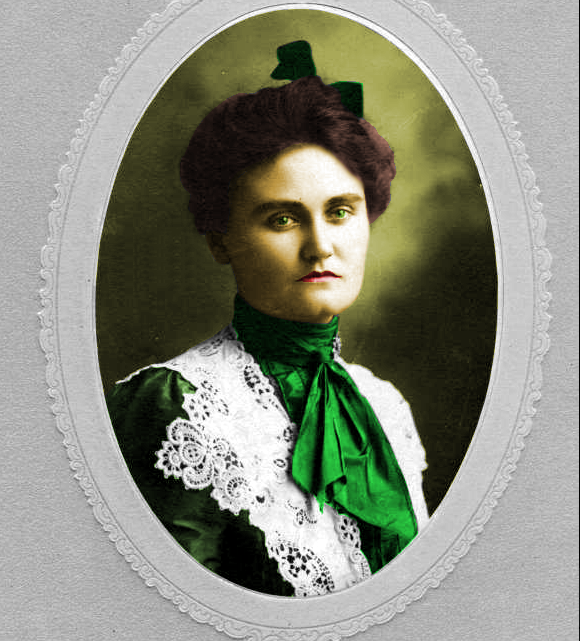 She was born in April of 1878 as Fredericke Blank in New London, Wisconsin to Henry and Clara Blank. As she approached her teen years, her parents’ marriage fell apart and Freda went to live with her aunt and uncle, David and Mary (Meyers) Rudd in Reedsburg in 1891. Aunt Mary was her mother’s sister and had married David Rudd just seven years early. She was 36 and he was 63 when they married and the couple had no children of their own. David Rudd made his fortune beginning with farming in the Reedsburg area. Later he went into partnership with his brother and others in the Reedsburg Bank. Rudd and his brother also purchased 1,400 acres of forest in Monroe County where they set up a saw mill which grew into a small town called Rudd’s Mills. Later he was part owner of the Reedsburg Woolen Mill. When he died in 1896, Mary was 48 years old and Freda was 18. The two women traveled extensively and became involved in volunteer and charity efforts in Reedsburg. Mary continued her husband’s involvement with the Reedsburg Bank and her fortune continued to grow. When Mary died in 1924 she left her entire fortune to her niece. Her will stated her intention that if Freda had died before her, the money would go to the City of Reedsburg for various projects and trust funds. Freda lived out this wish of philanthropy. During her lifetime she paid for the construction of a manse for the Presbyterian Church and provided a trust fund for its upkeep. As a member of the hospital board, she bought and then donated the land for the construction of a new hospital on Park Street. She also helped pay for its construction and set up a fund for maintenance. In 1928, Freda married Edward Nishan whom she met in New York City. Edward, who was ethnically Armenian, had left Turkey to pursue a career abroad. The Nishans settled in Reedsburg and were married for a little over ten years before Freda died of cancer in 1938. Freda’s estate had grown to over $550,000 ($9.8 million today). Freda’s will set up a number of trusts for family, church, the city and high school scholarships. One of the first projects was the construction of the Freda Meyers Nishan Memorial chapel located in Greenwood cemetery. Edward spent the next 36 years splitting his time between Reedsburg and Tucson, Arizona where he would spend the winters. He made several donations to the fire department, the Presbyterian church and the hospital during that time. Each year, the trust fund Freda established for the Reedsburg school district distributes about $45,000 in educational scholarships to Reedsburg graduates. Fred a Meyers Nishan left $5,000 to the Sauk County Historical Society upon her death in 1938. This was the same time that the Society was looking for its own building after leaving rooms in the basement of the court house. The money Freda left allowed the Society to purchase the Van Orden mansion in 1938 and turn it into the Sauk County Historical Society. In 1951, when Herbert H. Webb was 92 years old he returned to his adopted hometown of Reedsburg to live in a small trailer parked on a friend’s property. It was not that he couldn’t afford anything else, in fact, he could have purchased any home in town or entire block of homes. Webb returned to Reedsburg as one of the richest men in the county with a fortune likely in excess of half a million dollars. His story, however, began with much humbler beginnings. Webb was born in upstate New York in 1858 to Hiram and Anna Webb. His father died just eight days after his seventh birthday and a few years later Webb moved to Sauk County with his mother, brother and grandparents settling in the rural Town of Washington. As young men, Herbert and his brother George worked hard on the family farm and had little time for education. Webb attended high school in Reedsburg when he could. Eventually he was able to attend Northern Indiana Normal School and Business Institute (Valparaiso University) and when he returned to Reedsburg in 1881 he became a bookkeeper in a retail establishment. Just two years later he went into partnership with D. G. Schweke and G. C. Schweke and opened a department store nicknamed the “Boy’s Store.” The establishment, officially called the Big Store, grew steadily and in 1886 a new store building was built on one of the best corners in downtown Reedsburg. Ten years later a massive addition was built making the side of the store front on an entire block. The store sold everything needed from “cradle to grave” and was the largest retail establishment in the county. In 1907 the partnership was dissolved and Webb and his wife, Carrie (Clizbe), moved to the Chicago area. Webb established a cold storage business and also invested in land in Des Plaines, Illinois where he developed two successful subdivisions. Webb also became involved in the stock market. After the death of his wife Carrie in 1921 Webb moved to Long Beach, California where he rented a small cottage before later moving to Arizona. Seven years before he returned to Reedsburg in 1951, Webb endowed the city of Reedsburg with a trust fund of $300,000. (over $4 million today) The proceeds from the fund were to be used for public purposes. The first project was the creation of a park on the city’s northeast side. Webb returned to Reedsburg in 1951 in time for the dedication of Webb Park the following year. He died three years later in January of 1954. His will left the bulk of his remaining fortune to the city for the purpose of building a new high school. While the city had already begun the preparations and financing to build the new high school at the time of Webb’s death, only the first part of a three part project was undertaken at the time due to costs. Webb’s bequest allowed for the construction of phases two and three of the high school making for a complete facility. The new high school was dedicated in 1957 as the Herbert H. Webb High School. The building served in this capacity for forty years before a new high school was built and it became the middle school. The Webb endowment still exists today and is valued at over $2.5 million. The fund has paid for over $1.3 million in projects in Reedsburg in just the last 30 years of the funds 70+ years of existence. Average annual net income that can be spent amounts to about $45,000.